I hope you’re hungry! Follow my vegan plate for the day as I indulge in my new favorite cereal, killer guacamole and more. Yum! As for my own plate, my new year’s resolution to swap from vegetarian to vegan has been much more fun than I ever would have guessed! A whole new world of food and seasoning has been opened to me and I truly find myself enjoying cooking all that much more. 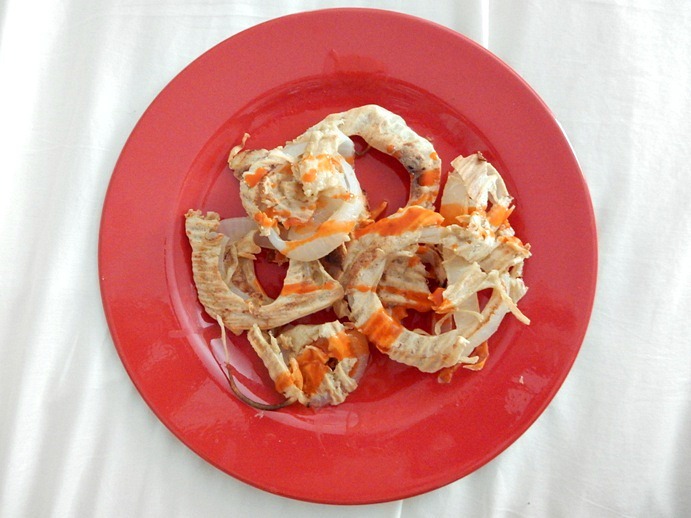 In today’s post, I whip up a tangy slaw, homemade onion rings, fresh guacamole and more. 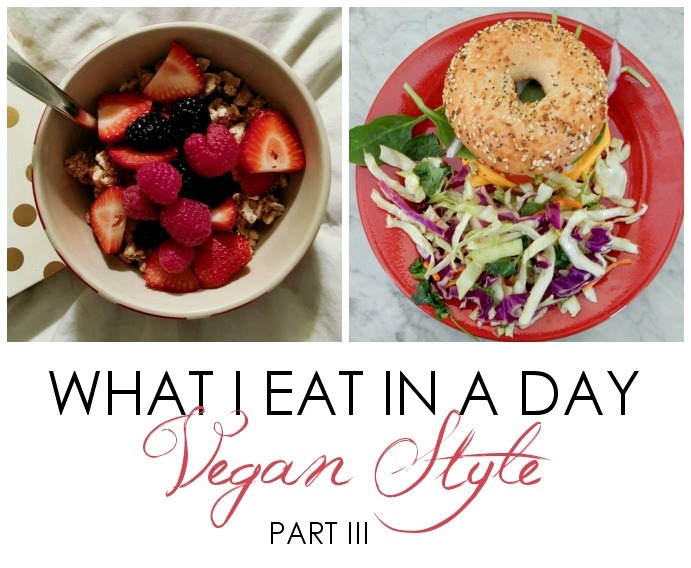 The vegan lifestyle has been ever so rewarding and helped me get to a place where I feel energized and enthusiastic about preparing fresh, delicious food. And let me tell you, it’s a whole lotta fun being your own favorite restaurant. Now, follow along as I walk you through what I ate on Sunday. Yum, yum! 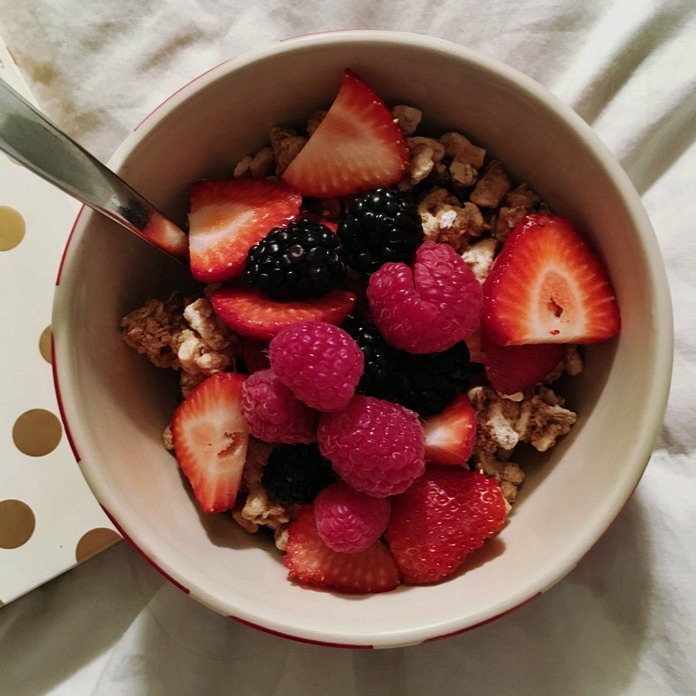 My Vegan Breakfast: Ginger granola cereal with mixed berries and almond milk. First up, breakfast. Lately, Sunday mornings have brought tasty vegan pancakes to my plate but this week I elected for my latest favorite cereal instead. Trader Joe‘s ‘Ginger, Almond, & Cashew Granola’ is oh so delicious! As much as I adore ginger, I never would’ve considered adding it to granola before but it’s such a refreshing zing in the morning. 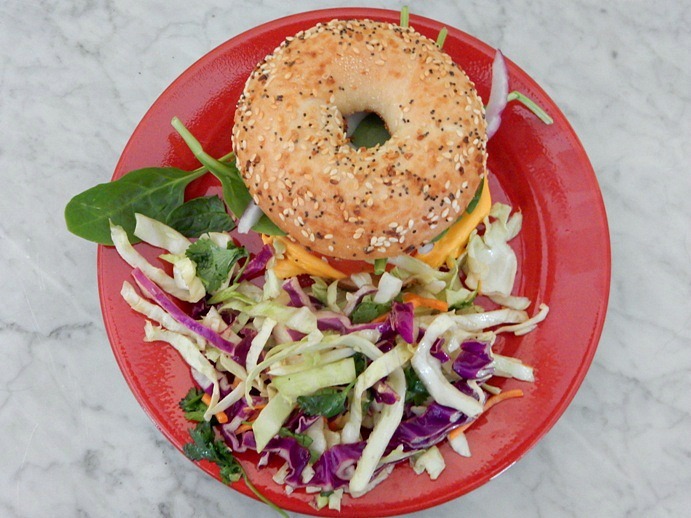 My Vegan Lunch: Toasted ‘everything’ bagel with a slice of vegan cheddar cheese, fresh raw spinach, sliced tomato and red onion – with a tangy cilantro slaw on the side. I told you I made a tasty slaw, didn’t I? Once again, thanks to Trader Joe’s, this was a real breeze. I picked up a bag of the slaw-ready veggies that spared me all the time of cutting cabbage and carrots myself. To that, I added half a bundle of fresh cilantro, a quarter cup of apple cider vinegar, 3-4 tablespoons of olive oil (taste until you’re happy), the juice of a lime and fresh ground pepper. A tasty and refreshing dish that takes practically no time (or skill) to make. Oh, yes! You know those random cravings that pop up now and then? The recipe: For the batter, I combined coconut milk, flour, cumin, paprika, black pepper and garlic powder. Then, I sliced one white onion and coated the rings in the batter before laying on a parchment paper-lined baking sheet. Once all of the onion slices were coated and ready to go, I popped that into the over for 20 minutes, then flipped and finished off under the broiler for about another 3-4 minutes. Next time, I think I’ll omit the paper and go for just putting the rings straight onto my baking sheet with lots of cooking spray. As delicious as these were, when flipping the onion rings and serving…the batter did tend to pull off. But still, a very delicious treat! 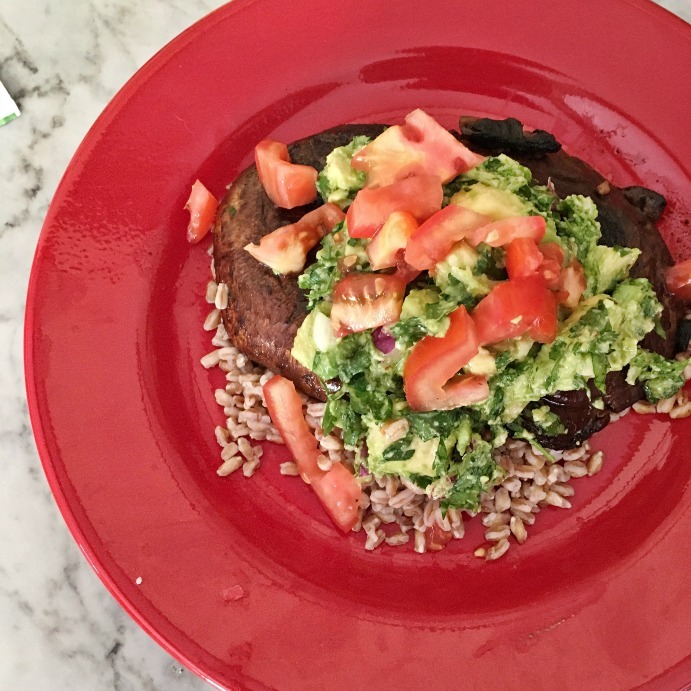 My Vegan Dinner: Marinated portabella mushroom steaks and chunky guacamole, served with farro and diced tomatoes. Three things I love, a lot? Portabella mushrooms, farro and guacamole. So why not put them all together, right? For the Mushrooms: I created a marinade by combining balsamic vinegar, olive oil, diced garlic cloves, cumin, and ground pepper in a ziploc bag. Then I added my mushrooms to absorb and marinate away in the fridge for a couple of hours. Then, I took a saute pan above medium heat and cooked each side for 4-5 minutes. For the Guacamole: I’ve been making a lot of guacamole in 2016 and my recipe seems to be ever evolving. In a nutshell, you will always need two avocado, half a bundle of cilantro, a couple cloves of garlic and some olive oil. From there you can experiment and have some fun. Rather than mashing or pureeing the avocado this time, I decided to cut it into cubes to make a more ‘chunky’ version. To that, I added about a quarter cup of diced red onion and the juice of a lime. Stir together, not to vigorously, and you’re left with this beautiful guacamole that is the perfect topper to your mushrooms. Farro: Farro doesn’t really have a ‘recipe’ but I wanted to give it a shout out. Quinoa is great, but farro is my love. This hearty grain is a great source of protein and will seriously fill you up! If you’re busy during this week, try whipping up farro on Sunday and store in your fridge to easily have on hand with veggies through the week. Good stuff! Thank you very much for reading and an extra thank you to those who took the time to ‘vote’ in my Twitter poll. *woo* I hope I was able to give you some ‘foodie’ inspiration to come up with tasty treats for your own plate. Do let me know, which meal most strikes your fancy? Also, if you’re hungry for more foodie snooping, give me a follow on SnapChat (dreaminlace) where I regularly snap my way through preparing vegan recipes. Or, just give me a follow if you like random car karaoke and watching adorable dogs do adorable things. Wishing everyone a happy and safe weekend! You also may enjoy reading: My favorite vegan Mediterranean pasta recipe, here!